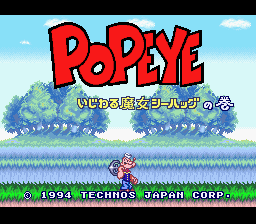 This is one of two Popeye games developed by TechnoSoft. (Best known for Kunio Downtown Series) Unlike other Popeye games that were Japan-Exclusive though, This one is actually planned to be release in North America. But it ended up never happen. OK Enough about history and then jump into the game! The Story : Sea Hag used her magic turn Popeye’s friends into the stone. The only way to turn back to normal is find all of Hearts that were separate from Popeye’s friends. The problem is General Blozo saw the Hearts and think it should be for solider. So he announced that anyone who can collect most Hearts wil be reward with a 100,000,000 G!!! Making everyone tried to find the Hearts. Including Bluto! The Gameplay : It’s mixed between 2D-Platformer and Board Game Style. The gameplay in the maps is just like Mario Party. (Heck, This game even had a 2-Player mode!) When you encouter an enemy, or enter the levels, The gameplay will be changed into 2D-Platformer which control and play like a Mario games. The other thing is the luck system IS ALL OVER THE PLACE. Heck, Even in 2D stage also including the luck system. I don’t mind this very much since it’s a minor thing but sometimes it can screw you up so be careful! The Graphic and Music : The graphic are really nice and very good for a SNES game. The music is quite good and fit the game very well, There’re some music that come from the cartoons too! Overall : It’s good game. Sure the Board Game Style and that luck system might make some people don’t like this game. But it’s still enjoyable. Simply put “Nothing outstanding but also nothing terrible either.” If you’re a Popeye fan, Check this one!